Kent is a county in England, south-east of London. The county town is Maidstone. Kent has land borders with East Sussex, Surrey and Greater London, and a defined boundary with Essex in the middle of the Thames estuary. Kent also has a nominal border with France halfway along the Channel Tunnel. The two cities in Kent are Canterbury, the seat of the Archbishop of Canterbury, and Rochester, the seat of the Bishop of Rochester. However, since 1998 when local government was reorganised, Rochester lost its official city status through an administrative oversight; attempts are now being made to regain it. Kent, because of its soubriquet "the Garden of England", might be regarded as a picturesque rural county, but farming is still an industry. Over the centuries many other industries have been of importance; some still are. Woollen cloth-making, iron-making; paper; cement; engineering: all have been part of the industrial scene. Fishing and tourism occupy many people, especially the coastal resorts. The East Kent coalfield was mined in the 20th century: and there is a Nuclear Power Station located at Dungeness. Nevertheless, the district of Thanet has been regarded as one of the most disadvantaged areas in the south-east of England. Ferry ports, the Channel Tunnel and two motorways provide links with the European continent. There are airports at Manston and Rochester and smaller airfields at Headcorn and Lydd. Famous residents of Kent have included Charles Dickens and Charles Darwin. Sir Winston Churchill's home Chartwell is also in Kent. Although the Victoria County History for Kent is limited, an extensive survey of the county was undertaken over a 50-year period by Edward Hasted between 1755-1805. William Lambarde was an even earlier writer, in the 16th century. The area has been occupied since the Lower Palaeolithic as finds from the quarries at Swanscombe attest. During the Neolithic the Medway megaliths were built and there is a rich sequence of Bronze Age, Iron Age and Roman occupation indicated by finds and features such as the Ringlemere gold cup and the Roman villas of the Darent valley. The modern name Kent is derived from the Brythonic word Cantus meaning a rim or border, being applied as a name to the eastern part of the modern county, and meaning border land or coastal district. Julius Caesar described it as Cantium, home of the Cantiaci in 51BC. The extreme west of the modern county was occupied by other Iron Age tribes; the Regnenses and possibly another ethnic group occupying The Weald. East Kent became one of the kingdoms of the Jutes during the fifth century AD and the area was later known as Cantia in about AD730 and Cent in AD835. The early Mediaeval inhabitants of the county were known as the Cantwara or Kent people, whose capital was Canterbury. Canterbury is the religious centre of the Anglican faith, and home of St Augustine of Canterbury. Augustine is traditionally credited with bring Christianity to the county and thus to England in 597. Following the invasion of Britain by William of Normandy the people of Kent adopted the motto Invicta meaning undefeated and claiming (quite wrongly) that they had frightened the Normans away, presumably in an attempt to defame the people of Hastings in neighbouring Sussex. During the medieval period, Kent produced several rebellions including the Peasants' Revolt led by Wat Tyler and later, Jack Cade's rebellion of 1450. Thomas Wyatt led an army into London from Kent in 1553, against Mary I. Canterbury became a great pilgrimage site following the martyrdom of Thomas Becket. Canterbury's religious role also gave rise to Chaucer's Canterbury Tales, a key development in the rise of the written English language and ostensibly set in the countryside of Kent. By the 17th century, tensions between Britain and the continental powers of the Netherlands and France led to increasing military build-up in the county. Forts were built all along the coast following a daring raid by the Dutch navy on the shipyards of the Medway towns in 1667. During the Second World War, airfields in Kent became played a vital part in the Battle of Britain while civilian settlements were often bombed. Kent is the southeasternmost county in England. It is bounded on the north by the River Thames and the North Sea, and on the south by the Straits of Dover and the English Channel. The continent of Europe is a mere 21 miles across the Strait. The major geographical features of the county are determined by a series of ridges running from west to east across the county. These ridges are the remains of the Wealden dome, which was the result of uplifting caused by the Alpine movements between 10-20 million years ago. Erosion has resulted in these ridges and the valleys between. From the north they are: the marshlands along the Thames/Medway estuaries and along the North Kent coast; the chalk North Downs reaching heights of around 600ft; the sandstone and clay valley containing the River Medway and its tributaries; the Greensand ridge; the Wealden clay valley and finally the sandstone High Weald. The highest point of the county is Betsom's Hill, GR TQ435563, at 251m/823ft. Probably the most significant geographical feature of Kent is the White Cliffs. It is here that the North Downs reaches the sea. From there to Westerham is now the Kent Downs Area of Oustanding Natural Beauty AONB. The Weald derives its ancient name from the Germanic word wald meaning simply woodland. Much of the area remains today densely wooded; where there are also heavy clays the tracks through are nearly impassable for much of the year. Kent's principal river, the River Medway, rises near Edenbridge and flows some 25 miles (40km) eastwards to a point near Maidstone when it turns north. Here it breaks through the North Downs at Rochester before joining the River Thames as its final tributary near Sheerness. The river is tidal as far as Allington lock, but in earlier times cargo-carrying vessels reached as far upstream as Tonbridge. There are other rivers in Kent. In medieval times the Weald was of national importance for two industries: the iron industry and cloth-making. Kent is sometimes known as the Garden of England because of its agricultural influence, extensive orchards and hop-gardens. Distinctive hop-drying buildings called oast houses are common in the countryside, although many have been converted into dwellings. Nearer London, market gardens also flourish. Paper needs a supply of the right kind of water: in Kent the original mills stood on streams like the River Darent, tributaries of the River Medway, and on the Great Stour. Two 18th century mills were on the River Len and at Tovil on the River Loose. In the late 19th century huge modern mills were built at Dartford and Northfleet on the River Thames; and at Kemsley on The Swale. Cement came to the fore in the 19th century when massive building projects were being undertaken. The ready supply of chalk available, and huge pits between Stone and Gravesend bear testament to that industry. There were also other workings around Burham on the tidal Medway. Coal was mined in East Kent: from about 1900 several pits were operating, and Snowdown Colliery was opened in 1908. The coalfield is now closed. Kent is traditionally divided into West Kent and East Kent by the River Medway. This division into east and west is also reflected in the term Men of Kent for residents east of the Medway; those from west are known as Kentish Men. However, further investigation shows that the division is not the Medway, but further east in Gillingham. Edward Hasted, in his 1798 description of Rainham, writes: "The whole of this parish is in the division of East Kent which begins here, the adjoining parish of Gillingham, westward, being wholly in that of West Kent." The division, according to one historian, Freddie Cooper, a former Mayor of Gillingham, remained until April 1, 1929 when Rainham was transferred, despite protest, from the administration of Milton Rural District Council to that of Gillingham. 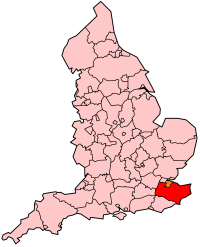 In religious matters, Kent was divided between the two episcopal areas of Canterbury and Rochester. A lathe was an ancient administration division of Kent, and may well have originated during a Jutish colonisation of the county. These ancient divisions still exist, but have no administrative significance. There are seven Lathes in Kent; Aylesford, Milton, Sutton, Borough, Eastry, Lympne and Wye. these units are recorded as intermediate between the county and hundred. The Domesday Book reveals that in 1086 Kent was divided into the seven lathes or "lest(um)" for administrative, judicial and taxation purposes and these units remained important for another 600 years. Each of the seven lathes were divided into smaller areas called hundreds, although the difference between the functions of lathes and hundreds remains unclear. A Manorial court was an early form of dispensing justice which came into being after the Domesday Book. Among other things it dealt with land tenure. After the 17th century most of the court's functions were taken over by a Justice of the Peace, who had first been appointed from the 14th century. From 1361 until 1971 the justices met four times a year in Quarter Sessions. In Kent there were separate courts of Quarter Sessions (at Maidstone and Canterbury) until 1814. Under the Poor Law every parish had had the responsibility of looking after its own poor, and seeing that they had the bare minimum of shelter, food, clothing and medical attention. In most parishes the burden of poor relief mounted rapidly in the early part of the 19th century. Huge population increase, and the lack of work on the land, made it imperative that the Poor Law was amended. It was, in 1834, when the institutions known as workhouses came into being. These were often run by a group of parishes — hence the title Union Workhouse. Boards of Guardians were set up to oversee them. Boards of Health, in much the same way as the Boards of Guardians for the poor, were set up in 1875, because of the huge rise in epidemics, notably of cholera. The area of the sanitary districts, as they were known, coincided with the union boundaries. Larger parishes (<5000 people) became urban sanitary districts — or, as they became known, urban districts — while the smaller ones evolved into rural districts. Highway boards also came into being, and the old turnpike trusts gradually expired. The final sub-division of Kent was into towns which had been granted a charter by the Crown giving them special privileges, including that of having a mayor. In addition the village of Fordwich also counted as a borough: it was deprived of that status in 1882. The Local Government Act 1888 created an administrative county of Kent, with its own county council in 1889. At the same time, northern parts of Kent came under the County of London and Canterbury became a county borough with similar powers. The county council's duties at first were few, but gradually it absorbed School Boards, the rural Highway Boards and the Boards of Guardians. In 1894, parish councils were set up. These were civil parishes, and unconnected with an ecclesiastical parish. Although since 1979 there have been many changes in local government, parish councils now are in a strong position, particularly in unitary authorities, where they act as a second tier. In other districts, some functions are held by the county council, relegating parish councils to a less influential third-tier status. Parish rates are today collected by the district or unitary tier and then disbursed to parish clerks. Those parish councils serving areas of denser settlement are normally known as town councils although their rank and influence is much the same. These traditionally elect a mayor from the town councillors with the greatest experience. The London Government Act 1963 created an enlarged Greater London in 1965 which took in more of northen Kent. The Local Government Act 1972 abolished the previous structure of local government in 1974 and created a new non-metropolitan county of Kent, divided into districts. It also abolished Canterbury as a county borough which became a district under the new county council. 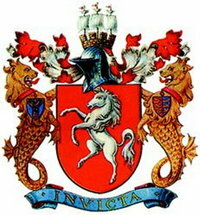 In 1998 the districts of Gillingham and Rochester were removed from county council government to become the unitary authority entitled the Borough of Medway. When the County of London was created by the Local Government Act 1888, the new county incorporated part of north west Kent including Deptford, Greenwich, Woolwich and Lewisham. Penge was gained from Surrey by the London Government Act 1899. Further change came in 1965, when the County of London was abolished and Greater London took its place. The places that had been removed in 1888 were amalgamated to form the London Borough of Lewisham and the London Borough of Greenwich and two further boroughs were created. These were the London Borough of Bromley, an amalgamation of Bromley, Beckenham, Chislehurst, Orpington and Penge and the London Borough of Bexley comprising Bexley, Sidcup, Erith and Crayford. Much of the north-west of the county is part of the London commuter belt. The Thames Gateway regeneration area includes riverside areas of north Kent as far east as Sittingbourne and largely to the north of the A2 road. The ceremonial county of Kent corresponds to the administrative county plus the district of Medway (or Medway Towns). Chatham_Dockyard It has been suggested Chatham originated the word chav.